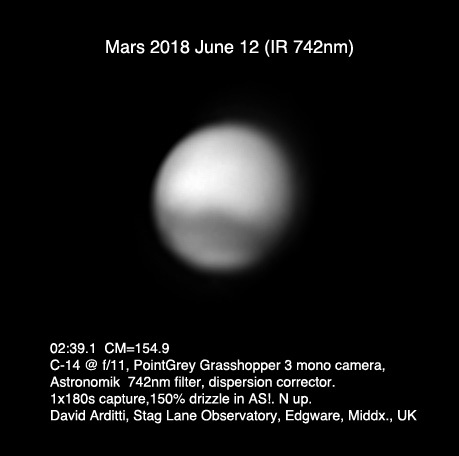 This was the start of my Mars observing campaign for the 2018 apparition. My method for coping with the very low altitude (no more than 17º) is to use the C-14 at native focal length (f/11), so obtaining a very bright image through an IR filter, and taking many thousands of very short exposure to stack (24,000 in this case). The seeing was very poor in this case, and I stacked only the best 12% of them. I used the 1.5x Drizzle function in Autostakkert! to enlarge the image.